A decadent and rich chocolate cake, Bananas Foster Fudge Cake combines the best of two favorite American desserts - Bananas Foster and Chocolate Cake. Attractive and tasty, this dessert is sure to please your family and friends who gather for the holidays or a birthday celebration. Beth Royals of Richmond, VA created this spectacular dessert as a way to combine her family’s favorites into one delicious dessert. Preheat oven to 350°F (175°C). Lightly coat three 9-inch-round cake pans with non-stick cooking spray. For Bananas Foster: Combine brown sugar and butter in medium, microwave-safe bowl. Microwave uncovered, on HIGH (100%) power for 1 minute. Add chopped bananas, rum extract and cinnamon; stir. Microwave an additional 4 minutes, stirring once. Cool completely. For Cake: Combine cake mix, pudding mix, eggs, sour cream, vegetable oil and water in large mixer bowl. Beat on medium speed until well blended (batter will be thick). Pour about 1 1/2 cups of batter into each prepared cake pan. Sprinkle each with a heaping tablespoon of mini morsels. Bake for 20 minutes or until wooden pick inserted near center comes out clean. Cool in pans on wire racks 10 minutes; remove to wire racks to cool completely. For Chocolate Frosting: Heat cream in uncovered, medium microwave-safe bowl on HIGH (100%) power for 1 1/2 minutes or just until boiling. Add morsels; let stand 5 minutes. Stir until smooth. Cover; cool for 30 minutes. To Assemble: Place one cake layer on serving platter. Spread half the cream cheese frosting on cake. Spread half the banana mixture to 1/2-inch of edges. Top with second cake layer. Spread with remaining cream cheese frosting followed by remaining banana mixture. Top with remaining cake layer. 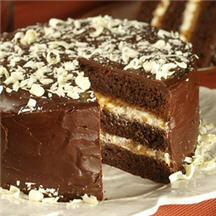 Spread Chocolate Frosting over top and side of cake. Sprinkle with Premier White curls around top edge of cake. Refrigerate until chocolate is set. Refrigerate leftover cake up to 24 hours. Note: If using two cake pans, pour about 1 1/2 cups batter into each prepared cake pan. Refrigerate remaining batter. Bake as stated above. Bake remaining batter in clean pan. Tip: To make Premier White curls, carefully draw a vegetable peeler across a bar of NESTLÉ TOLL HOUSE Premier White Baking Bar.